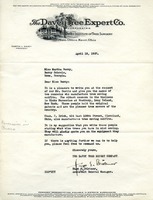 Miss Berry writes Mr. Davey to thank him for sending Mr. Brautigam to help with the trees. 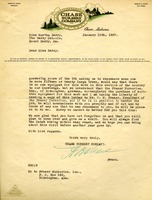 She says that the boys have benefitted from the instruction. 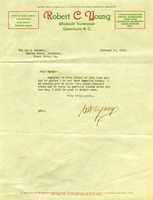 She also invites Mr. Davey to visit anytime and asks him to send the moving picture. 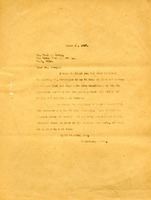 Letter to the President of The Berry School from Hugo E. Birkner about insect pests and fungous diseases in the vicinity. 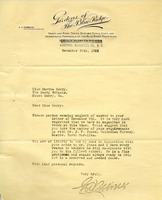 Hugo writes to Martha about the presence of pests and fungous diseases on some of the trees at Berry and the options available to look into the trees. 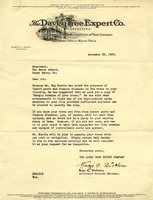 Letter to Miss Martha Berry from the Davey Tree Expert Co. 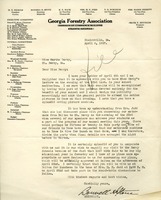 This letter discusses the visit made to the campus by Ray Geeslin as he inspected the trees. 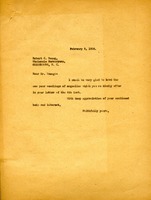 He explained that there were many trees that need work or needed to be removed. He also explained that he told the superintendent of the grounds about some good fertilization methods. 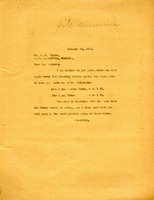 He wanted to set up a time to further discuss what was found and what they can do about it. Bonnell writes to Martha delighted to have Miss Gerry's lecture on the 23rd in the Berry auditorium, and addresses the concerns that Martha has about the motorcade from Dalton to Mt. Berry. 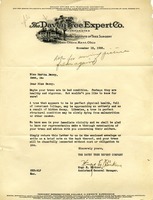 A letter from Hugo E. Birkner's company, The Davey Tree Expert Company, telling Martha Berry that they will examine Berry's trees without cost.